If you’re running your race to win, you have to be in divine alignment with the right place. That’s right, place. Places are important to God. Places are a key part of any divine interruption; a key part of kairos, right-place-right-time moments of destiny. You can’t always do much about the timing, and the subject of timing pertains to the anointing of the sons of Issachar, and that’s another blog post. But you can most definitely do something about the right place, right people, and right thing, so that’s what this blog series is about. Places are special. God cares about places, and He divinely appoints specific things to happen at His chosen locations. Mary had to be at Bethlehem, the House of Bread, in order to birth her destiny (which was to become the mother of our Lord) according to the prophecies. Jacob had to be at Bethel, the House of God and the gate of Heaven, in order to see the ladder to Heaven that was there. Hannah had to be at the tabernacle at Shiloh in order to receive the blessing of the High Priest—Eli—which produced her son Samuel in her womb. David had to be at the Valley of Elah that day in order to hear the giant mocking the Lord–to which he responded, “Is there not a cause?” and declared that this uncircumcised Philistine would not conquer against the armies of the Lord. Then he backed up his declaration of victory with divinely-empowered action and delivered Israel from Philistine intimidation. Place matters. And the physical place I believe the Holy Spirit is emphasizing more than ever in this season is the house of God–your local church. And let us consider one another in order to stir up love and good works, not forsaking the assembling of ourselves together, as is the manner of some, but exhorting one another, and so much the more as you see the Day approaching” (Hebrews 10:24-25). I am in love with my local church, and am deeply connected there. I came there in 2003 because a friend invited me. I stayed because I found there a house of bread, a house of God, and a home for my hungry, hurting heart. I am fed there every week. I get to spend time there with my spiritual family–my kindred spirits, my brothers and sisters, whom I cherish. I serve there in deeply-fulfilling ways, and will be serving more as God makes a way. All of my earthly spiritual fathers are there. I love to spend time with them, to honor them, and to receive from them too. I receive ministry there when I need it. I have been taught, mentored, challenged, and given opportunity there. I see many benefits to my being at this place, this house of bread. But you know what? I know beyond a shadow of a doubt that I have received many benefits that I cannot even see from being there. I have received the benefits of their prayers, because they are godly men and women of prayer and the Word. I have received spiritual, physical, and emotional protection because they are good shepherds who emulate Jesus in their shepherding. They pour out their lives, day in and day out, for the sheep. I even believe that I have received an impartation of writing. I’ve been able to write for many years because I was taught by an elementary school teacher who was a very good writer himself. However, my writing has gone to places I could never have sent it alone. I honestly believe that much of that is because I sit under a pastor who is a prolific and anointed writer himself, having written dozens of books and having a worldwide media ministry. Has there been an impartation of that anointing to write and communicate? I believe so, absolutely. Coming into divine alignment with this place–this physical location, the local church–has changed my life. God brought me into this place. It’s a wide place, a place I now call my home. A local church that is led by true shepherds and fathers. And because I am divinely aligned at this place–under authority and in a church that is both a house of bread and a house of God—the Lord continually advances me into a higher dimension of my destiny. And I believe one of the most urgent mandates of the Holy Spirit for this season is: Get into divine alignment with His place, the local church. Are you in divine alignment with your local church? Are you deeply connected to the house of bread, the house of God? Are you established at this field of victory, your covenant home, and the house of those who would be fathers to you? Maybe you are already connected to your local church, and you’re as faithful as the sun to rise in the morning and be there. Maybe you already agree with everything I said above, and you’re already in divine alignment in this area. If so, that’s great. But maybe you’re not yet in divine alignment with the right place, the house of God. Maybe you have a local church, and you’re sort of faithful, but, well, not really. You attend when you want to, and you don’t when you don’t. Or maybe you don’t attend at all. If that’s you, precious, it’s important for you to understand that you’re missing out on something huge. Something your spirit and soul need as much as your body needs air. Every time the believers assemble, the Lord has Holy Spirit downloads and upgrades for you. You can’t receive impartation and ministry from your fathers when you don’t spend time with them in the PLACE. You can’t win victories when you don’t show up on the battlefield. You can’t grow in relationships when you don’t show up to the place where your kindred spirits are. This is not a guilt trip, but it is a time for new understanding, revelation, and new dimensions of your destiny. And the simple fact is that you can’t delight in Father’s banquet if you don’t show up for the meal. Please. Please. Please. Please hear me. It’s a new season. God wants to do something new in your life. So please, align yourself now with the house of bread to which God has called you, and be faithful to dine there at His table week in and week out. Whether you feel like it or not. Whether you want to or not. Whether you think it’s a good idea or not. Please, beloved. Don’t miss the extravagant buffet of spiritual bread and the outpouring of the Holy Spirit that the Lord prepares for you every week. Please. Please join with the local body at the place of His Presence. And if you aren’t in divine alignment with a local church at all—if you don’t have a house of bread because you can’t find one, or you didn’t know it was important, or for whatever other reason—then beloved, it’s time to find one. 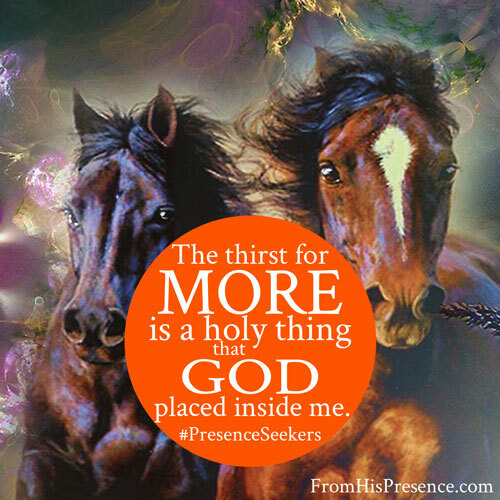 Being divinely aligned with the Place of His Presence will change your life. How do you find a local church if you don’t already have one? has a pastor who is a spiritual father. Find a LifeGroup or Sunday School class where you can grow, and be faithful to attend it every week. Do what you need to do to meet people and make friends. Dig in to community life at your church. And if it takes you awhile to find a local church, you’re welcome to watch mine remotely by live streaming until you do find one where you live. Beloved, the local church is your house of bread. It’s the place with which you must be divinely aligned in this new season. What do you need to do to align your life with the Body of Christ and sit under God’s funnel of blessing? Is the Holy Spirit speaking to you about divine alignment with your local church? If so, please leave a comment below. I’d love to hear from you. Reminder: My Arise, Shine! 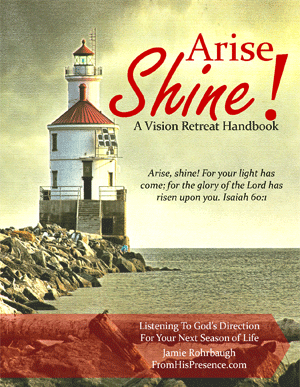 printable vision retreat handbook (with loads of bonus material) is available for instant download for only $14.99. Arise, Shine! contains tons of teaching and exercises, walking you through an entire vision retreat so you can get heavenly downloads for your new season. Click the book cover to purchase it on Gumroad! This is a very good message in a very opportune time in my Christ walk. I am in a dilemma at this time because my pastor is in sin. He has entered into a domestic partnership with another person and when bought before the officers of the church he stated the document is a power of attorney document. The majority of the board agreed six to four vote although they had the court document in hand. The church is being torn apart because this man is blatantly lying and as a result of being caught in homosexuality a divorce happened. And now he was transferred to my church because the previous church wanted him out. He is blessing the Holy Communion and baptizing folk knowing that he is in blatant sin. Please pray that the higher ups remove him from the pulpit immediately. God, have mercy. That’s horrible. I pray the Lord would give you wisdom and protection during this time, and that the Lord would rise up as Chief Shepherd and protect His own flock. If he is not removed and is living in or preaching apostasy, I would encourage you to seriously consider and pray about whether the Lord would have you stay or find a new church home. Have mercy, God, and change the hearts of the kings like water. Jamie, your topic and shall I say your prophetic word on ” Divine Alignment: Being in the right place” is a Rhema Word for me!!! I thank God for you!!! This message is verbatim what my pastor taught on last Sunday!!! He emphasised being in the right place and being rooted and grounded in the church so that we can be established and grow from what God is imparting!!! The Lord is really speaking to me here!!! I just asked the Lord this morning for a Word as I’m faithful in doing early morning Devotion before I start my day and as soon as I said it, I received your email on Divine Alignment which is exactly bwhat I heard on Sunday morning!!! My heart leaped asI know the Lord is speaking to me and giuding me!!! I’m elated that He confirms HiscWord and answers mevehen I call on Him!!! I pray that the Lord continues to impart in you because you are a divine blessing to me and a plethora of others! I bind any distractions and sk the Lord to build a hedge of protection around you!! I have heard the prophetic word and I’m making sure that I’m rooted and consistent with my church to hear and receive God’s Plan for me. Well, Kahn, that comment by itself made this post worth the hours I spent writing it, even if no one else in the world had read it! Oh, how I love the church! If the Lord will use this post to touch you with His passion for His Church, then I praise God. Thank You, Father! And sister – I’m so glad Papa is speaking to you and, just as important, that you are listening! May He download into you holy impartations and upgrades today, together with a FAITHFUL spirit, in Jesus’ name! Oh dear Jamie. I thank God for you. I thank him profusely that he is using you to teach and show me so many things. I would love to be able to sit with you over coffee and just talk and get to know you. Over the last few months the Lord has used you to speak to me about my new season, what I need to be focussing on, what I need to be doing. I have been without a church home for a few years for a variety of reasons and have been telling myself that yes, I will get around to finding another one. I’ve been trapped on Oneday Isle. I’m on the cusp of some big and exciting changes in my life and I believe they are all blessed by God but now he has shown me that without this step – finding a new church home – my progress will be severely limited. This only confirms for me that I am on the right path as far as my new season is concerned. Thank you for being such a willing, loving and obedient servant of our Father God. You have blessed me so much. I pray our Daddy God would continue to bless you in the work he has given you to do, to fill you with more of the precious Holy Spirit and grant you the desires of your heart as I am sure he is so well-pleased with you. Thank you so much for sharing your thoughts. Have a wonderful day! Jamie, thank you for this word,for I have been struggling if I I’m in the right place? I have been attending the same church for the past two years it’s a small church with few members and was convinced this was my church home. My sister also joined a year later and gave her life to Christ. We are both very faithful in the ministry. My sister had given her testimony earlier that day to to our pastor. That night we had service and a guest speaker called her out and prophesied over my sister. And as he was doing this my sister said he had repeated everything she had told our pastor! I was raised in a nazarene church and not accustom to this and it has always made me feel uneasy and I would just over look it. But this time I can’t over look it . I just don’t understand why a pastor would share a testimony with someone else and then try to use as a prophecy? Is this normal? I feel like a level of trust has been broken and question his motives! Now looking for a new church home but not sure if I’m doing the right thing?